it’s been a while since my last post. we’ve been in philadelphia for almost a month now. nancy’s parents didn’t have internet at their house and we’ve been out a lot lately, so not much time for posting. i just got a connection setup at the house now so hopefully i can catch up a bit. i guess i’ll just do a sort of big download dump of things that have been going on. i’ve been taking some pics and video so i’ll post some. we’ve been hanging out with song and shankey, our friends living in havertown, pa… or as they call it, have-no-town. most of the time has been spent going to concerts and doing bar crawls in philly. it’s such a different vibe here compared to the west coast. it’s very refreshing and fun. we saw blonde redhead in washington, dc and then a week or two later we saw elvis costello at the electric factory in philly. both were really good shows. i was lazy about taking a camera to the blonde redhead concert, in favor of just absorbing the experience emotionally. i prepared everything for elvis costello but got booted at the door so no pics there either. anyway, both great shows. 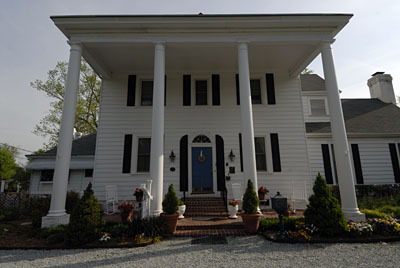 ok, so here is a download of sorts… we stopped at a cool bed and breakfast on the way up from atlanta to philadelphia. inbo and his family came up with us. the bed and breakfast was called the arrowhead inn and it was located in Durham, North Carolina. Durham was a small college oriented town. It had a nice flair with all the old historic tabacco buildings and such, but I could see myself going batty after a short while there. We had dinner at a nice italian restaurant. for some reason i was surprised how conservative the environment was, most every man there had a suit or at least a tie on. anyway, the drive up was nice and the inn was very nice.